I got up early this morning and went to the gym. I like working out in the mornings. I also like sleeping. These two interests of mine don’t really mesh all that well, but if I can drag myself out of bed at 5:15 and get my booty to the gym I am almost always very, very, very glad I did. I mean when else would I get to lip sync to the songs in my iPod while running on the treadmill? The people at the gym probably need me for entertainment as much as I need the time on the treadmill or with the weights. Luke used to make eggs and toast for himself for breakfast every morning. Every. Morning. Not anymore as he has decided 10 more minutes of sleep is more important to him than a plate full of eggs. Me on the other hand? I’ve always been an easy breakfast kind of girl. Cereal my go to breakfast. I like instant gratification when it comes to most things. Especially when I’m still wishing I was in bed and my tummy is hungry. On workout mornings I come home hungry and ready to eat but a bowl of cereal just isn’t enough to fill me up. With driving hunger and impatience when it comes to actually making a big breakfast I have come up with a handful of easy, filling, and yummy post-workout breakfasts. In the next few days I will share these little tummy fillers with you. I think of it as my civic duty to share these yummy breakfasts with you. I like these breakfasts so much they sometimes make their way into my breakfast bowl or plate on non-morning-workout days. Here is the exact breakfast I scarfed down this morning. I just ate it and it looks good enough to eat again. Toast English muffin. Spread peanut butter on English muffin. Both crunchy and creamy are good so use whatever your heart desires or love the most or desires and loves the most. 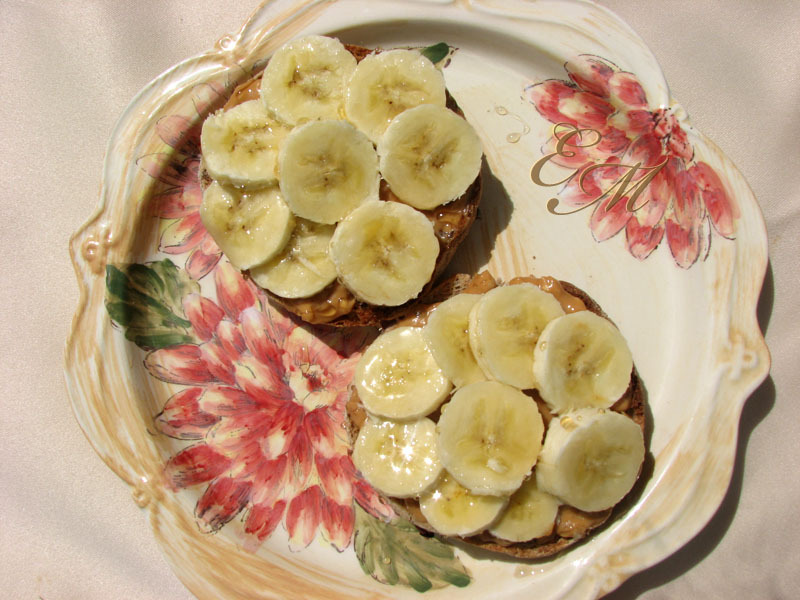 Slice the banana and arrange the slices so they cover each side of the toasted and peanut buttered English muffin. To top it off drizzle a little honey over the top of the banana slices. Enjoy. Saver. Fall in love with the goodness that is peanut butter and bananas uniting.